I had a New Belgium Frambozen Raspberry Brown Ale tonight. Not sure why I purchased this beer. I probably got in the Thanksgiving spirit and just couldn't pass it up at the liquor store. It is fruity (has lots of raspberry flavor in it ... just in case you could not tell from the name). If you like raspberry beers, you'll probably like this one. It is ok, and I'll drink the whole 6 pack, but I probably won't buy it again. 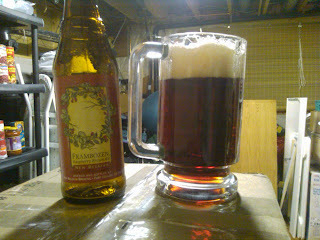 It does have an amazing ruby red color that I would love to recreate in one of my beers. I bet the color has something to do with the fruit, so I probably won't be able to recreate it. Bummer. Tonight, "Brew Masters" is on the Discovery Channel. I wonder what Sam has in store for us tonight. Can't wait.